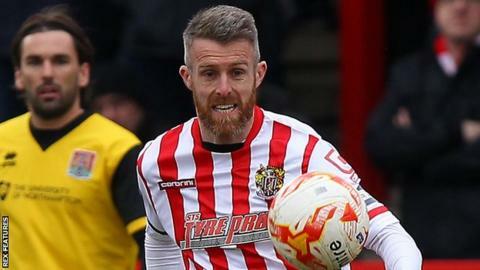 Michael Tonge's late penalty earned Stevenage victory at Luton and moved them nine points clear of the League Two relegation zone. The experienced midfielder slotted home to end a six-game winless run after Olly Lee was adjudged to have tripped Ben Kennedy in the area. Luton's Alan Sheehan curled a second-half shot against the crossbar. But their best chance was wasted by Jack Marriott when he was denied by keeper Jamie Jones when one-on-one. Luton remain mid-table, while Stevenage now seem all but safe in League Two, with York and Dagenham & Redbridge running out of matches to close the gap. Match ends, Luton Town 0, Stevenage 1. Second Half ends, Luton Town 0, Stevenage 1. Olly Lee (Luton Town) wins a free kick in the defensive half. Attempt missed. Jack Marriott (Luton Town) right footed shot from a difficult angle on the right is close, but misses to the right. Attempt saved. Jonathan Smith (Luton Town) header from the centre of the box is saved in the centre of the goal. Corner, Luton Town. Conceded by Luke Wilkinson. Goal! Luton Town 0, Stevenage 1. Michael Tonge (Stevenage) converts the penalty with a right footed shot to the bottom right corner. Penalty conceded by Olly Lee (Luton Town) after a foul in the penalty area. Penalty Stevenage. Ben Kennedy draws a foul in the penalty area. Substitution, Stevenage. Aaron O'Connor replaces Greg Luer. Attempt saved. Jonathan Smith (Luton Town) right footed shot from outside the box is saved in the centre of the goal. Foul by Charlie Adams (Stevenage). Substitution, Stevenage. Dale Gorman replaces Dean Parrett. Charlie Adams (Stevenage) wins a free kick on the left wing. Attempt saved. Jack Marriott (Luton Town) right footed shot from the right side of the box is saved in the bottom right corner. Stephen O'Donnell (Luton Town) wins a free kick in the attacking half. Foul by Bradley Pritchard (Stevenage). Attempt saved. Danny Green (Luton Town) right footed shot from outside the box is saved in the centre of the goal. Corner, Luton Town. Conceded by Fraser Franks. Substitution, Luton Town. Pelly Ruddock replaces Scott Cuthbert. Substitution, Luton Town. Danny Green replaces Paddy McCourt. Substitution, Luton Town. Josh McQuoid replaces Joe Pigott. Attempt missed. Ben Kennedy (Stevenage) right footed shot from the left side of the box is close, but misses to the right. Corner, Stevenage. Conceded by Stephen O'Donnell. Dean Parrett (Stevenage) wins a free kick in the defensive half. Hand ball by Bradley Pritchard (Stevenage). Corner, Stevenage. Conceded by Glen Rea. Attempt blocked. Dean Parrett (Stevenage) right footed shot from outside the box is blocked. Attempt missed. Ben Kennedy (Stevenage) left footed shot from the right side of the box misses to the right. Attempt saved. Jack Marriott (Luton Town) right footed shot from the left side of the box is saved in the centre of the goal. Substitution, Stevenage. Charlie Adams replaces Jake Mulraney. Attempt missed. Paddy McCourt (Luton Town) right footed shot from outside the box is close, but misses to the left.